Each year since 2004, the Blaine County Historical Museum has asked community groups to name ladies to its Heritage Court, which honors women who have contributed to shaping the history of the Wood River Valley. The nominees must have lived in the valley for at least 30 years and be at least 70 years old. This year’s nominees are Dorothy Ann Outzs of Hailey, Vivian Bobbitt of Bellevue, Elizabeth “Betts” Simon of Sun Valley and Joyce Edwards of Carey. The women will be honored in a coronation ceremony at the Liberty Theatre in Hailey on Sunday, June 22, at 3 p.m. The public is invited. The four ladies will ride in a vintage carriage in Hailey’s Fourth of July Parade, Carey’s Pioneer Days Parade, Ketchum’s Big Hitch Wagon Days Parade and Bellevue’s Labor Day Parade. Each issue since June 11, the Idaho Mountain Express has included a story profiling one of the 2014 court nominees. 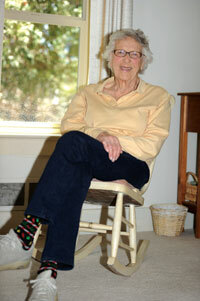 This issue features Dorothy Ann Outzs. Dorothy Ann Outzs was born in 1922 in Hailey and lives in the house her grandparents built on Third Avenue at the turn of the 20th century. She taught physical education and health for 35 years in Bellevue, Wash., before returning to the Wood River Valley in 1990 to care for her mother. About that time, she began losing her sight to macular degeneration. Outzs is the daughter of Les Outzs, who served as a sergeant in the Army during World War I and as Blaine County sheriff for 20 years. Her mother, Mary, was born in Hailey in 1900 to Irish immigrants who had fled the Potato Famine to work in the mining industry out West. “My mother always said that during the Depression, we did not know we were poor because everyone else was poor also,” said Outz, who laughs easily while recalling the challenges and adventures of her life. Growing up during the Great Depression meant living as frugally as possible. Her father, a jack-of-all-trades who ran a garage on Main Street, and later a service station, once found a five-dollar bill in a drainage pipe. “You’d have thought it was a thousand dollars the way they reacted. There was just so little money around in those days,” she said. Outzs’ mother and her friends played bridge regularly. The winning prize was a coveted pair of silk stockings. The party would then take place at the winner’s house, where the stockings would once again be the prize. “The stockings would get passed around town in this way, but were never opened,” Outzs said. Outzs graduated from Hailey High School in 1940 and attended the University of Idaho in Moscow for four years, earning a teaching degree. Outzs took a job teaching in Midwest, Wyo., an oil company town with 100 residents, few of whom were men. “The only ones in town were 4F, which meant they were unqualified for service,” said Outz, who never married and has no children, though her career would involve inspiring thousands of children to stay healthy. Outzs met a friend who encouraged her to get a master’s degree, and another who introduced her to a school superintendent in Bellevue, Wash., which in 1945 was a place where strawberries were grown for the city of Seattle. She began teaching there and stayed on for 34 years, during a period of tremendous growth. Outzs met friends who worked for Boeing who shared her appetite for adventure and travel. During summers, they saw the world, riding bicycles and hiking across Europe, China and Japan. She also paddled her kayak around Puget Sound, in Canada and in Baja, Mexico. Her house is filled with mementos from her travels. She has a collection of pictures and stories that she would like to organize into a travelogue. “This is something I would like to accomplish while I still am able,” she said. Outzs attended the Baptist Church in Hailey briefly when she was a young girl, but never found time for religion as she grew up. Recently, a former student of Outzs’ named Sandy Horn looked her up on the Internet. Horn, who was in Outzs’ class 40 years ago, followed in her footsteps and earned a teaching degree. She now lives in Fairbanks, Alaska. “Sandy was writing her own history and she said she finally realized that she’s an artist. She sends me paintings of sunflowers and poppies. She knows I can’t see them, so she puts some thickener in the paint so I can touch them and see them that way.” Outzs no longer cooks at home, but enjoys the company of old friends at the Senior Connection in Hailey, where she eats regularly. “The last grilled cheese sandwich I flipped did not land in the pan,” she said. She also enjoys free morning exercises for seniors at the Community Campus. “I can catch the Mountain Rides bus right out front to exercise, and then catch the Senior Connection bus to eat lunch,” she said.